On Friday March 16th, fight fans gathered in the masses to support Hong Kong and the regions hungry young martial artists. it was an evening of multiple levels of entertainment, suspense and celebration. Here we look at the Top 3 finishes of JUST CKF – Hong Kong 2. Number 1: Co-main Event Knock Out by Sasha Palatnikov. Matched against Korea’s current Sambo World Champion of 2017, Ko Seok Hyuen is no potato. Round one took off and the two began to pick each other apart immediately. Sasha’s head movement and boxing was strong, playing with angles and connecting. Ko was no different, countering and landing combinations of his own until his strength is Sambo became evident. Ko racks up the take downs but Palatnikov is able to stand back up and separate, breaking with more boxing combinations. The first round ends with Palatnikov defending ground and pound by being offensive, distracting with a Kimura attempt. Palatnikov turtles up but Ko comes off and loses the back mount, both men finish on their feet, Palatnikov breaking with another combination. The second round begins, Ko at an energy advantage after being able to work in dominant positions in the first. Palatnikov keeps his composure and with great boxing, head movement and timing, slips Ko’s strikes, quickly changes his angle and lands a one-two clean on the chin of Ko causing him to fall back. Still conscious, Palatnikov pounced, connecting Ko’s chin this time with a flying punch in Ko’s guard. 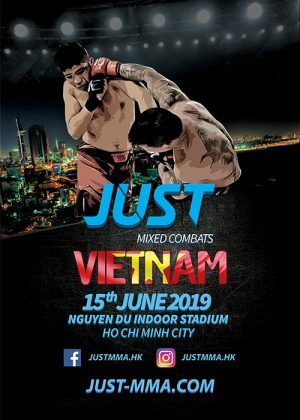 Referee Thomas Fan Steps in to call the fight. 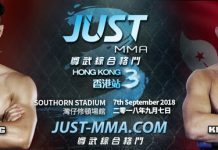 After making his professional Shooto Japan debut less that 3 weeks before JUST CKF – Hong Kong 2, Max Leali does Hong Kong proud and showcases his ability as a grappler. 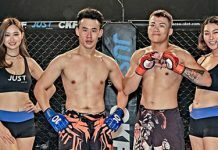 His opponent, Cao is trained in Sambo and fighting in MMA for over 2 years. The pair waste no time getting started, touching gloves and immediately Cao connects with his first combination. Leali counters with a jab and a knee to the head moving Cao backwards into the fence and applies pressure resulting in a take down for Max Leali. Cao quickly tries to defend with a barimbolo but Leali as none of it, immediately pressuring into a leg-drag half guard and initiating ground and pound. Leali climbs up Cao’s torso and looks for an arm triangle choke and eventually ends up in mount. Cao is determined not to give up and bumps defensively to save himself. Leali transitions between a triangle choke and am arm bar to mounted triangle to more ground and pound but Cao refuses to surrender. The second round begins and Leali picks up where he left off, closing the distance and taking Cao down against the cage to finish the fight where it left off. Leali reigns down the ground and pound and allow Cao to cover up giving his back. Leali capitalises and secures a Rear Naked Choke for the tap. The girls started wasting no time, trot into the centre of the cage. Amanda starts off with a combination pushing Ashleigh backwards using a push kick to regain distance. Ashleigh throws a combination ending with a low kick, as Amanda retaliates lands a push kick nullifying Chan’s attempt. Ashleigh attempts to enter on a one-two-three but as Amanda presses forward misses a take down causing Amanda to fall. The two resume in the centre of the cage where Ashleigh continues to use her jab and push kick. Amanda lands a solid hook and the two exchange until Amanda calls time, losing a contact lens amidst the action. The two go back to their corners and the fight resumes shortly after this time at an even faster pace. Ashleigh runs in to restart the round and immediately lands a couple stiff jabs on Amanda. Chan counters and the two go at it again. It seems Chan has some difficulty landing on Ashleigh due to the height advantage. Chan continues to circle away but seems that Martin is walking her down not letting her rest. She lands a clean right hook, walks her down landing another stiff jab. Ashleigh fakes a couple push kicks and as Amanda steps in Ashleigh lands a quick One-two causing Amanda to wobble backwards. She lands a cross clean on the temple causing Chan to fall, Martin secures the win, referee Tessa Ho calls the fight.